For the first time ever, women have been given the opportunity to play Australian Rules Football at an elite level. The inaugural AFLW match took place last night at Princes Park, and I was there to witness it. This event was momentous. Not only for women in sport in general, but particularly in this sport. The AFL is famously and notoriously laden with misogyny. There has not been a season where a player, coach or commentator has not been involved in violence against women (actioned or threatened – although they may claim they were only ‘joking’). And when the inaugaural AFLW season was mooted even those in the higher echelons of the AFL stated that it would only be popular if the women ‘wore lycra’ to make it more interesting. So this was the weekend where Melbourne got a chance to prove the haters wrong. And they did! Over 24,000 people turned up to see Carlton defeat Collingwood. I couldn’t get a tram from work and had to walk 4km with hundreds of other people to get there. Once I did arrive, I only just made it through the gates before they shut them. They ran out of beer 8 minutes into the first quarter. People gathered outside the ground and waited, patiently, for security to confirm whether they would be allowed in. The organisers underestimated us. They didn’t take account of the power of the people and they lost sight of this city’s sentiments. We love sport. We love competition. And we (increasingly) love equality. Admittedly there is still a long journey ahead of us but at least we are now having the conversation. If you do anything over the next few weeks, get to a game. Support women in sport. Show the powers that be that we are passionate about equality of opportunity (and not only when they wear Lycra!). Let’s make this a success. 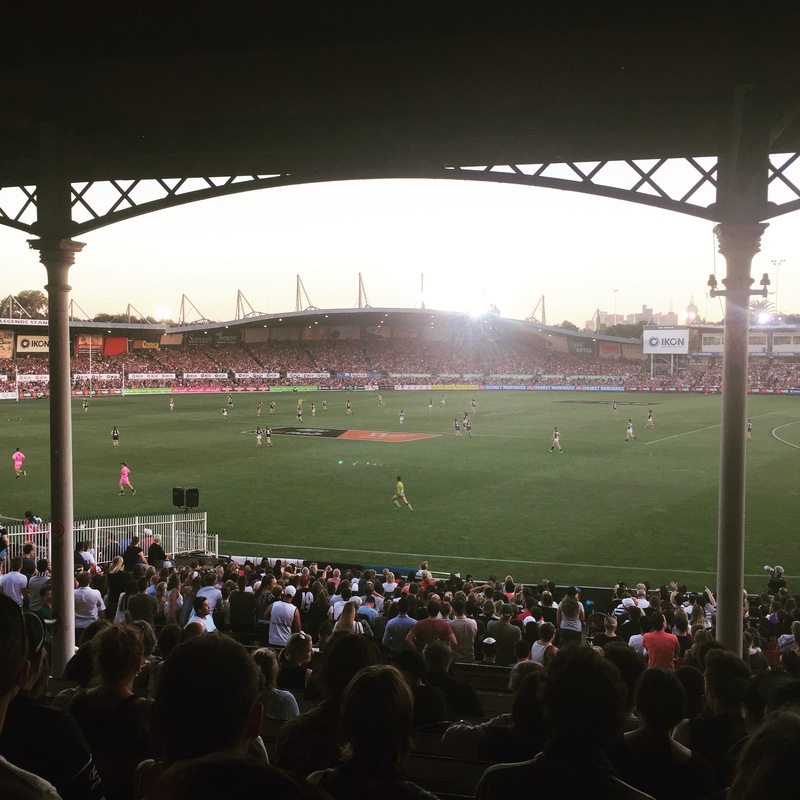 View from the old stand at the inaugural AFLW match. Feb 3 2017.